Dodge owners know that anything is possible. Whether they are running laps around the racetrack or running errands around town, a Dodge never forces its owner to sacrifice pleasure for practicality. In true American fashion, Dodge vehicles boast big, fast, and powerful designs and capabilities. So, don’t settle. Don’t compromise. With Dodge, you can grow up without giving up on the vehicle you’ve always wanted. It’s the American dream! We’ll make sure purchasing your Dodge vehicle is Fun with a capital F! Our Brand Ambassadors will let you stay in the driver’s seat throughout the entire buying process, so you’ll be sure you’re receiving the best deals and customer service available. Since they know Dodge vehicles backwards and forwards, they are more than ready to answer all of your questions! You deserve undivided attention, so choose Freeland today! 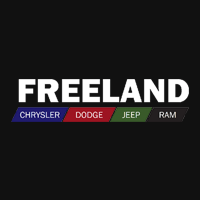 Freeland Dodge, At Your Service! No one knows Dodge like we do. That’s why our dedicated and certified Service Advisors are your best bet for superior, top-of-the-line servicing. Trust the experts with your baby…we’ll make sure she’s running better than ever before when we’re through! We’ll treat your vehicle like it’s one of our own, and at a reasonable price point too!